Does Automatic Downloads on iPhone 6 use cellular data on international roaming? 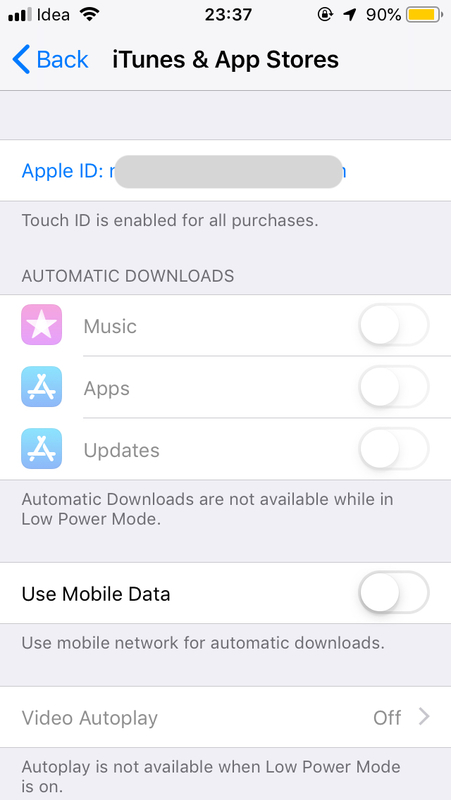 Under Automatic Downloads for iTunes & App Stores, there's a setting for downloading app Updates. Does it use cellular data while on international roaming? Whether to download app updates over Mobile Data is a user configurable setting. Go to Settings app → iTunes & App Store and turn off Use Mobile Data. This will ensure that app updates are not downloaded over mobile data even if it is enabled. This setting doesn't take into account device roaming status (which itself is configurable under Settings app → Mobile Data). Even if Use Mobile Data is enabled here, it still needs the Mobile Data itself to be enabled under Settings → Mobile Data. If you are concerned about using data while roaming, turning off Mobile Data under Settings will ensure that no cellular data usage will happen. How do I ensure iphone wont use cellular data?